As the name suggests, it can be thought of as a Mixolydian scale with a b6, but it can also be seen as Aeolian with a major 3rd (the latter perspective may be more appropriate for when an Aeolian chord is majored. For example, if a chord progression comprising F, G and Am was changed to F, G and A, Mixolydian flat 6 could be used over the A chord – try it!). 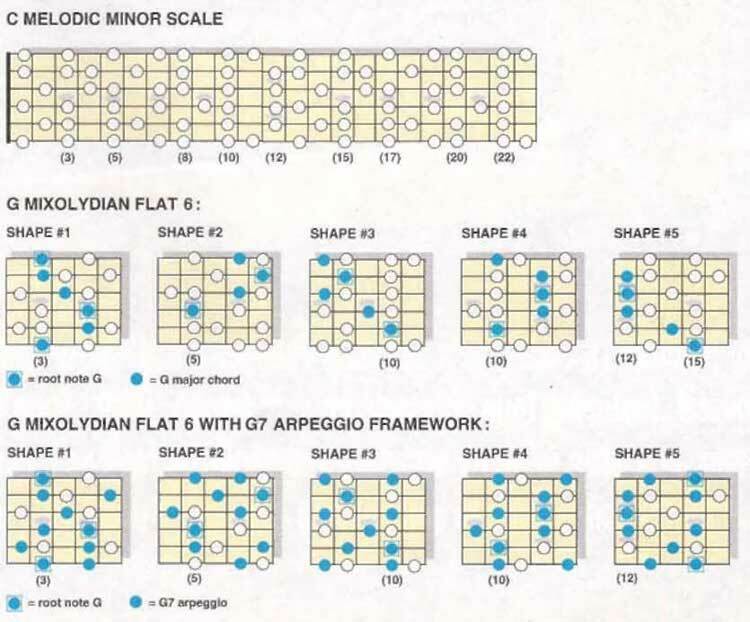 Furthermore, because it’s the fifth mode of the melodic minor (also known as jazz minor), Mixolydian flat 6 is also sometimes referred to as jazz minor five (or JM5). We’ve given you five scale patterns for G Mixolydian flat 6, each containing a G major chord form as a framework on which to build the scale. We’ve also given you the same shapes again, each using a G7 chord as a framework. Remem­ber: these patterns are visual aids, so don’t worry if you find something awkward to finger. Once you have learned these chord-based shapes, you can play up and down the neck as you you like – our only interest is that you have a set of clear-cut visual reference points to guide you. Below, we’ve listed just some of the possible sounds that exist within G Mixolydian flat 6 that you should try. We suggest that you take some neck diagrams and plot out the shape of each device within all of the various scale shapes. This progression comprises chords which are diatonic to C melodic minor that resolve on a G chord. G Mixolydian flat 6 provides us with an ideal perspective. It enables us to see the notes of C melodic minor as a G scale – where the notes of a G major triad are the strongest within the scale. To my ears, the 5th mode always seems to be the tonal centre of melodic minor. Try playing all the chords of C melodic minor and you’ll hear that they all want to resolve on a G major chord. Upon hearing backing track, I decided to go for a Malmsteen-style approach and tried to interpret the scale using some of Yngwie’s trade­marks (a la ‘Save Our Love’). After all, Mixolydian flat 6 can also be thought of as Phrygian dominant (Yngwie’s favourite) with a nat 2. It’s a full lesson of Mixolydian Flat 6.